This week's "Faces Behind the Heroes" is Erin, an Army wife, mom, dog-lover and veteran. Talk about wearing a few hats! I am so glad Erin took the time to answer some questions so that we could get to know this very special Army Wife. How do you help them cope with military-life? We watch A LOT of Tinkerbelle, and Princes and the Frog, make play dates, and go to parks. We also take every moment we have together as a family, doing something nice and meaningful for our daughter. How many deployments have you been through? My husband and I were deployed together prior to being married. How many PCSs? 2, just moved from South Korea back to the US, prior to this we were in Germany and Iraq. How long were you in the Army for? I was in the military for just under 4 years and got out to care for our daughter. I was stationed in Germany, which is where my husband and I met and we deployed together to Iraq, then went to Korea together… I got out while in Korea, and we where there for 3 years, one of which I was active duty. When someone asks... “What can I do for you?” What is your response? Support your troops; let them know they are supported… it’s important that they know this. Where has your favorite post been? We LOVED Germany, we were stationed in Hanau, but it is now closed down. We miss Germany! Why? Germany is beautiful, close to many different places to sight see, the food is AMAZING, the beer is wonderful, the fest’s are a blast, and my favorite part is the Christmas season, there is nothing that can match Christmas like a Christmas in Germany. We have wonderful memories from Germany. Where do you find the support you need when you need it? My Mom and Dad are always there to listen when we (mostly me) have our bad days, but both of our families are amazing, they may not understand our lifestyle but they understand we are doing the best that we can, with our options and restrictions. What do you miss most about “civilian life”? During these difficult times, I don’t think there is much to miss. We are so thankful to the Army, for the security and the opportunities it gives us. We love the military life; it’s been wonderful to us, we plan on staying an Army family until retirement. What do you love most about “military life”? The traveling opportunities, the security for our family, the communities and the benefits. What in "military life" could you really do without? Of course we’d all like our husbands/wives home and safe, but in order to support them we let them go fulfill their missions. It’s hard at times, because it often feels like there is you, your spouse and the army in this marriage. “I’m married to the military” is a common saying. What are you passionate about? My family. It’s important to me that my daughter spends as much time with her Daddy as possible. I want her to know that when he is around, he’s giving her his all, and when he’s away, he’s still thinking about her and loving her, just as much as we are about him. When you move to a new post what is one of the first things you do? Search for housing; check out the community and research play groups and churches. Has anyone in the community (business, church, neighbor off base, etc etc) ever gone out of their way to help you, as the spouse of a military-member? My sister in law and cousin both had their students write our unit letters and send us care packages, it was so thoughtful and we loved it! People often go out of their way to say thank you for our service, and tell us how much they appreciate what my husband is doing, it’s really neat to witness. Do you use on base facilities? Commissary? Yes PX? Yes MWR? Yes Child Care? I have in the past, but currently I stay home with my daughter, so I have no need for it. But I will say that when we did use the Army CDC, my daughter really loved it! Why would you recommend one of these services in specific? I think the Commissary and PX are great because they are tax free… always a bonus! Something I’d like to share with other military wives: It’s very well known, but I read it when I go through difficult times where my husband can’t always be there because of missions. Thank you so much, Erin, for being a "Face behind The Hero"! 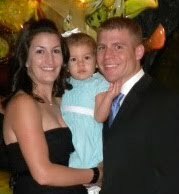 If you want to learn more about Erin read her blog at http://hooahandheavenlymoments.blogspot.com/. She is also on our blog roll, to the right: "Fellow Military Family Blogs". We have another interview lined for next week! So join us again.